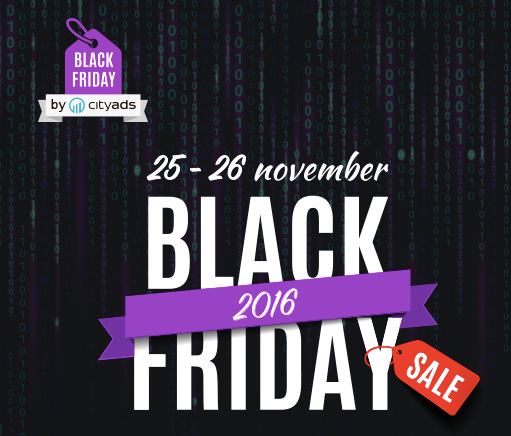 The First Online Black Friday in Southeast Asia by CityAds: GREAT DEALS, GREAT SAVINGS! How often do we go shopping and realized that the queue is tooooo freaking long? And then we resort to go online shopping, knowingly - not every site offer the same pricing or deals. Where do we find the best deal then? Well, CityAds CityAds offer convenience by giving you the opportunity to buy a lot with huge savings and discounts, all in one place – www.blackfridayasia.com. Starting from 25 November 2016, great deals and discounts up to 90% will be made available only on blackfridayasia.com for consumers from South East Asia, across a wide range of products and offerings. This is made possible by CityAds, a hi-tech provider of full-service performance marketing, organizes the First Real Online Black Friday in South East Asia (applicable to Malaysia, Indonesia, Thailand, and Singapore). So guys! Mark your calendar! The first ever ONLINE BLACK FRIDAY is coming to Malaysia in a big way! There will be a lot of online shopping websites are going to tremendously reduce the prices of goods for YOU! SO, HOW TO DO THIS....? Simple, register first, get offers and buy! You can choose the products that we have selected from multiple websites with discounts and deals. You must go to this website and check product availability. Finally, you can order the selected items with an incredible discount from our site! Major online shopping and retailers participating in this BLACK FRIDAY! CityAds bring you best deal from some of the most exciting online stores and retailers! Be sure to be at this online shopping craze! From Zalora to Lazada, Food Panda to ebay – they got you covered! "Black Friday" is the global SALE phenomenal day, which involves a lot of large and small retail chains and stores all over the world. The tradition comes from the USA, and the term "Black Friday" is said to first appeared in 1966. In the United States, it's common to organize a great sale in November, the day after Thanksgiving. So, if you are looking for a great deals and lots of savings, mark your day – this is your chance to grab the product and services you have been eyeing! Christmas and New Year is around the corner – better grab the deals before it’s too late! You have a great opportunity to buy with an advantage, from a wide selections of products and services from major online stores and retailers. If you are an online shop and you want to participate in this action, please send your offer to sea@cityads.com. Our managers will review the request and reply soon.